Field Marshal Sir John Greer Dill, GCB, CMG, DSO (25 December 1881 – 4 November 1944) was a senior British Army officer with service in both the First World War and the Second World War. From May 1940 to December 1941 he was the Chief of the Imperial General Staff (CIGS), the professional head of the British Army, and subsequently in Washington, D.C., as Chief of the British Joint Staff Mission and then Senior British Representative on the Combined Chiefs of Staff (CCS), played a significant role during the Second World War in the formation of the "Special Relationship" between the United Kingdom and the United States. Sir John Dill in Egypt, 18 February 1941. Born in Lurgan, County Armagh, Ireland in 1881, his father was the local bank manager and his mother was a Greer from Woodville, Lurgan. Always intended for a career in the services, Dill attended the Methodist College Belfast, Cheltenham College and the Royal Military College at Sandhurst. On 8 May 1901 he was commissioned as a second lieutenant into the 1st battalion the Leinster Regiment and was posted to South Africa to see out the Second Boer War. After the end of the war in June 1902, Dill left Cape Town with other men of his battalion on the SS Englishman in late September 1902, arriving at Southampton the following month, from where they were posted to Fermoy. Dill was appointed regimental adjutant on 15 August 1906, having previously been assistant adjutant from 1902. Promoted captain on 12 July 1911, he was seconded to study at the Staff College, Camberley from 1 February 1913, and was still there on the outbreak of the First World War eighteen months later. After briefly serving on the Staff of Southern Command he became brigade major of the 25th Brigade (8th Division) in France where he was present at Neuve Chapelle and won the Distinguished Service Order. During 1916 Dill served on the General Staff of the 55th Division and Canadian Corps, before being promoted to Lieutenant Colonel and Chief of Staff (GSO1) of the 37th Division in January 1917. He was moved to the General Staff at General Headquarters in October of that year, initially as part of the Training Section but was soon shifted to the Operations Section. By the end of the war he was a brigadier general and had been Mentioned in Despatches eight times. From the spring of 1918 he was Head of Operations at GHQ, an important promotion after the sacking of many of Field Marshal Sir Douglas Haig's senior staff following the Battle of Cambrai. He was appointed a Companion of the Order of St Michael and St George (CMG) in the 1918 New Year Honours. He also received a number of foreign decorations for his service, including the Officer of the Legion of Honour, the French Croix de guerre, Commander of the Order of the Crown of Belgium, Officer of the Order of the Crown of Romania. After the war he gained a reputation as a gifted army instructor. In the 1928 New Year Honours he was appointed a Companion of the Order of the Bath (CB). In 1929 he was posted to India and in 1930 was promoted to major general before returning to appointments at the Staff College (for in fact the third time but this time as Commandant) and then to the War Office as Director of Military Operations and Intelligence, holding that post until 1 September 1936. Alongside his other positions, he was appointed to the largely honorary role of Colonel of the East Lancashire Regiment on 24 December 1932, a position he held until his death. General Dill at the Atlantic Conference aboard Prince of Wales in 1941 (third from the right in second row/directly above Churchill). Following his service on the General Staff, Dill was sent to Palestine, during the Arab revolt, where he was appointed General Officer Commanding (GOC) of the British forces in Palestine on 8 September 1936, holding the post until 1937. He was knighted in the 1937 Coronation Honours with his promotion to Knight Commander of the Order of the Bath (KCB), and he was then appointed General Officer Commanding, Aldershot Command. The same year he was interviewed by Leslie Hore-Belisha, Secretary of State for War, for the post of Chief of the Imperial General Staff, but lost out to Lord Gort who was almost five years his junior. At the outbreak of the Second World War he hoped to be appointed Commander-in-Chief of the British Expeditionary Force, but the position again went to Gort. The resulting vacancy as Chief of the Imperial General Staff was filled by Sir Edmund Ironside, leaving Dill to be eventually posted as commander of I Corps in France on 3 September 1939. He was promoted to general on 1 October 1939 (with seniority backdated to 5 December 1937). On returning to the UK in April 1940, Dill was appointed Vice Chief of the Imperial General Staff (and a member of the Army Council), under Ironside, by the then Prime Minister Neville Chamberlain. On 27 May 1940, after Chamberlain had been replaced by Churchill, Dill replaced Ironside as CIGS. Faced with the prospect of a German invasion, Dill produced a memorandum on 15 June advocating the use chemical warfare against an enemy landing. Although acknowledging that first use of chemical weapons would alienate the United States and invite retaliation, he concluded that "at a time when our National existence is at stake ... we should not hesitate to adopt whatever means appear to offer the best chance of success." After criticism from the Director of Home Defence and other offices Dill withdrew the memorandum. Nevertheless the proposal was largely endorsed by Churchill on 30 June and it was ordered that the Royal Air Force begin preparations for deploying mustard gas, although he added that actual employment would need to be ordered by Cabinet. Dill was promoted field marshal on 18 November 1941, but by this time it was clear how poorly he and Churchill got on. Dill gained a reputation as unimaginative and obstructionist. Keen to get him out of the way, Churchill at the end of 1941 had Dill advanced to Knight Grand Cross of the Order of the Bath (GCB) and posted him to Washington as his personal representative where he became Chief of the British Joint Staff Mission, then Senior British Representative on the Combined Chiefs of Staff. Dill showed a great flair as a diplomatic military presence. In 1943 alone he attended the Quebec Conference, the Casablanca Conference, the Tehran Conference and meetings in India, China and Brazil. He also served on the Combined Policy Committee set up by the British and United States governments under the Quebec Agreement to oversee the construction of the atomic bomb. In the United States he was immensely important in making the Chiefs of Staff committee – which included members from both countries – function, often promoting unity of action. He was particularly friendly with General George Marshall and the two exercised a great deal of influence on President Roosevelt who described Dill as "the most important figure in the remarkable accord which has been developed in the combined operations of our two countries". Equestrian statue of Sir John Dill over his grave in Arlington National Cemetery. We feel we share equally with you the loss to our combined war effort resulting from the death of Field Marshal Sir John Dill. His character and wisdom, his selfless devotion to the allied cause, made his contribution to the combined British-American war effort of outstanding importance. It is not too much to say that probably no other individual was more responsible for the achievement of complete cooperation in the work of the Combined Chiefs of Staff. We mourn with you the passing of a great and wise soldier, and a great gentleman. His task in this war has been well done. He was posthumously awarded an American Distinguished Service Medal in 1944 as well as receiving an unprecedented joint resolution of the United States Congress appreciating his services. The equestrian statue on Dill's grave is one of only two at Arlington National Cemetery, the other is Major General Philip Kearny's. ^ "Sir John Dill". Liddell Hart Centre for Military Archives. Retrieved 21 August 2012. ^ "No. 27311". The London Gazette (Supplement). 7 May 1901. pp. 3128–3130. ^ Heathcote 1999, p. 102. ^ "No. 27944". The London Gazette. 28 August 1906. p. 5869. ^ "No. 28529". The London Gazette. 8 September 1911. p. 6628. ^ "No. 28687". The London Gazette. 4 February 1913. p. 844. ^ a b c Heathcote 1999, p. 103. ^ a b c Danchev 1991. ^ Harris 2008, p. 464. ^ "No. 30450". The London Gazette (Supplement). 28 December 1917. pp. 3–5. ^ "No. 31454". The London Gazette (Supplement). 11 July 1919. p. 8957. ^ "No. 31812". The London Gazette (Supplement). 5 March 1920. p. 2868. ^ "No. 31514". The London Gazette (Supplement). 19 August 1919. p. 10604. ^ "No. 31560". The London Gazette (Supplement). 19 September 1919. p. 11749. ^ "No. 33343". The London Gazette (Supplement). 30 December 1927. p. 3. ^ "No. 34319". The London Gazette (Supplement). 1 September 1936. p. 5659. ^ "No. 34319". The London Gazette. 6 January 1933. p. 129. ^ "No. 34327". The London Gazette. 29 September 1936. p. 6212. ^ "No. 34396". The London Gazette (Supplement). 11 May 1937. p. 3078. ^ a b c d Heathcote 1999, p. 104. ^ "No. 34753". The London Gazette (Supplement). 12 December 1939. p. 8305. ^ "No. 34709". The London Gazette (Supplement). 13 October 1939. p. 6933. ^ "No. 34855". The London Gazette (Supplement). 21 May 1940. p. 3091. ^ "No. 34873". The London Gazette. 14 June 1940. p. 3608. "No. 34878". The London Gazette. 21 June 1940. p. 3779. "No. 34920". The London Gazette. 13 August 1940. p. 4932. "No. 35068". The London Gazette. 7 February 1941. p. 750. "No. 35187". The London Gazette. 10 June 1941. p. 3320. "No. 35208". The London Gazette. 4 July 1941. p. 3820. "No. 35247". The London Gazette. 15 August 1941. p. 4719. "No. 35414". The London Gazette. 9 January 1942. p. 193. ^ "No. 34858". The London Gazette (Supplement). 24 May 1940. p. 3175. ^ a b Paxman, Harris; Harris, Robert (2011). A Higher Form of Killing. Random House. ISBN 1409021920. Retrieved 26 June 2018. ^ "No. 35352". The London Gazette (Supplement). 18 November 1941. p. 6693. ^ "No. 35399". The London Gazette (Supplement). 30 December 1941. p. 2. ^ a b Heathcote 1999, p. 105. ^ "Sir John Greer Dill, Field Marshal, British Army". Arlington National Cemetery. Retrieved 18 June 2016. 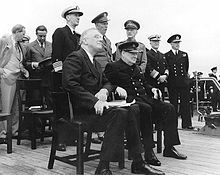 ^ "Letter Roosevelt to Churchill on the announcement of the posthumous honours to Dill". FDR Library. 10 January 1945. Retrieved 18 June 2016. ^ "A Very Special Relationship: Fireld Marshal Sir John Dill and General George Marshall" (PDF). Marshal Foundation. Archived from the original (PDF) on 12 May 2014. Retrieved 18 June 2016. ^ Danchev 1991, pp. 67–68. ^ "No. 36801". The London Gazette (Supplement). 17 November 1944. p. 5321. ^ McLeroy, Carrie (2 June 2014). "There's a lot you don't know about Arlington National Cemetery". United States Army. Retrieved 23 June 2014. There are only two equestrian monuments at Arlington National Cemetery. The first is for Maj. Gen. Philip Kearney, located in Section 2. The second is Field Marshall Sir John Dill in Section 32. Wikimedia Commons has media related to John Dill. Churchill, Winston S. (1985). Their Finest Hour: Volume 2: The Second World War. Houghton Mifflin Harcourt. ISBN 978-0-395-41056-1. Danchev, Alex (1986). Very Special Relationship: Field Marshal Sir John Dill and the Anglo-American Alliance, 1941–44. London: Brassey's Defence Publishers. ISBN 0-08-031197-0. Danchev, Alex (1991). Keegan, John (ed.). Churchill's Generals. London: Cassell Military. ISBN 0-304-36712-5. Harris, J.P. (2008). Douglas Haig and the First World War. Cambridge: Cambridge University Press. ISBN 978-0-521-89802-7. Danchev, Alex. "'Dilly-Dally', or Having the Last Word: Field Marshal Sir John Dill and Prime Minister Winston Churchill." Journal of Contemporary History 22.1 (1987): 21-44. Stoler, Mark A. (2003). Allies and Adversaries: The Joint Chiefs of Staff, the Grand Alliance, and US Strategy in World War II. Chapel Hill: University of North Carolina Press.